We had a nice Easter morning this year. 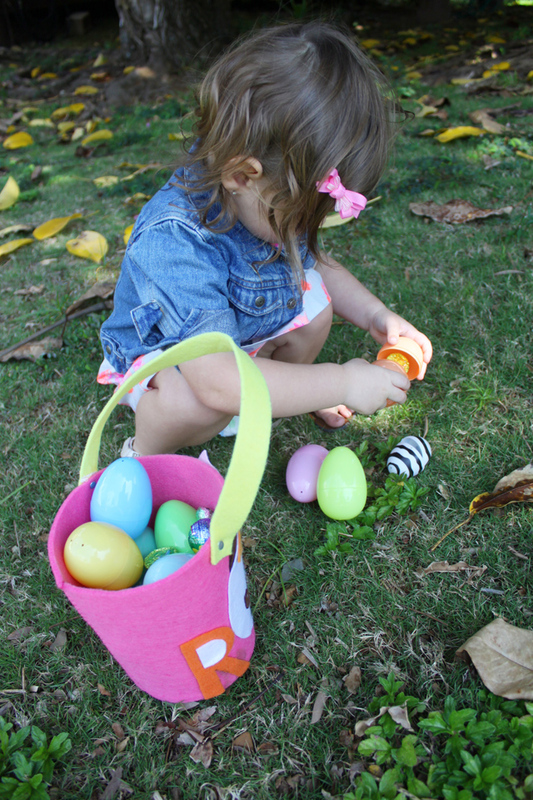 We kept it short and sweet with the baskets (hurry, hide the candy) but then took Rowan outside for her own Easter egg hunt. She was really excited about it and kept pointing to the eggs and saying "mama, egg! mama, egg!" and wouldn't move on to grab the next egg until I responded "wow, go get it!" She's been like that a lot lately... repeating a phrase over and over again until I respond with a specific response. It reminds me of that Family Guy scene where Stewie repeats different variations of the word "mom" until Lois says "what?" and he just says "hi" and runs off. Anyway, after the hunt, we took Rowan to the zoo and had a nice time in the sunshine with all the animals. I'd say it was a pretty good Sunday. OMG! In that first photo she looks like such a big kid! She's growing up so fast. Happy Easter and you know, I'LL SEE YOU IN A FEW DAYS. These photographs are so adorable! Rowan is such a cutie. She is growing up so fast! It's like with my little sister - can you just stay the same size for a little longer, please? Argh! Looks like you guys had a wonderful Easter. Rowan is growing up so fast. She looks adorable in her easter outfit. Looks like she had fun looking for the eggs. My 3 year old Bea just looked at these beautiful pictures with me and said..."what a pretty princess, she has shoes just like me! Look Easter eggs!" Thanks for sharing your wonderful Holiday, we love it!